This special 4-day Spiritual Insight Training was designed as a direct result of your requests. It combines our Part I and Part II trainings into one single comprehensive experience and is now available to you during our summer season! If you believe communication with spirit is only available to a few exceptionally gifted and unique people – please think again. We believe it is the birthright of every human being to experience this connection – and this retreat can prove it to you! First you will experience what is possible. Then you’ll take the next step to refine your perceptions, experience higher levels of spiritual insight, and become ever more accurate as you learn to trust and work with Spirit consciously. Learn the basics of spiritual meditation. Experience profoundly deeper levels of meditation through advanced meditation techniques. Receive training in the ‘mechanics of consciousness’. Discover the insight, clarity and lasting peace that come from practicing deep meditative states. Learn and experience ways of opening your heart to allow Divine love and healing to move through you. 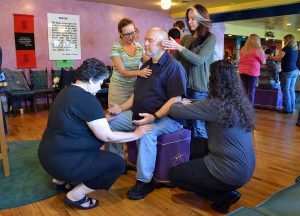 Experience and practice using healing energy with other people. Experience powerful new levels of your healing gifts. Experience the joy and satisfaction of being both an instrument and a receiver of spiritual healing. Learn a spiritually centered approach to unfolding and developing the abilities that you already have within you. Study the ways in which professional mediums work, and then discover your own inherent ability to give accurate spiritual readings! Highly effective techniques for accessing the ‘spirit loved one channels”. Learn how to connect with past life information. Whether you are a beginner or a seasoned student, you will gain remarkable new insights as you continue to develop your spiritual gifts. Even if you have never done anything like this before, this course will show you how to recognize and trust the spiritual gifts God has given you: gifts that will remain with you when you go home, providing you with a solid foundation for continuing spiritual growth.